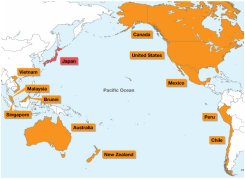 The TPP, short for the Trans-Pacific Partnership, has also been described as the ‘dirtiest trade deal you’ve never seen’. It’s a deal made in secret between twelve countries, the most important of these being the United States. Its effects are far reaching, with possible increases in the prices of essential medicines, negative effects on food safety standards, and significant tightening of Intellectual Property laws, which concern themselves with copyright. It could require ISPs to monitor internet traffic, and scariest of all, gives corporations the power to lobby government in secret. While many of these effects only apply to the countries within the deal, the effects on the internet are far reaching. Furthermore, there’s no expiry date or escape clause within the deal. Once it’s here, it’s here to stay. The deal has just been finalised in a set of secret meetings. The full content of the massive deal hasn’t been released yet and it has been stated it won’t be released before 19th October, which is notably after an election in Canada, in which the TPP is one of the major dividing issues. The section referring to copyright laws and intellectual property laws has been leaked, and it looks even worse than we expected. For example, the treaty appears to give countries power to stop the release of information via a trial in another country within the deal if the information is “detrimental to a party’s economic interests, international relations, or national defence or national security”. This is an attempt to protect against whistle-blowers like the well-known Edward Snowden. It is effectively thinly veiled censorship, and could spell doom on the freedom of speech online. I’ve often said that international law needs to be updated to cover the internet properly, but this was certainly not what I had in mind! There is a partner deal planned called the TPIP, which is considered a partner deal to the TPP, effectively extending its effects to Europe. Fortunately, even if the TPP is passed we should have some breathing room to stop the TPIP, as this isn’t expected to be finalised until 2016. The TPP’s effects on the internet will be felt by us immediately, however. Take action to stop this here: https://www.fightthetpp.org/. Think - there has to be a reason for the enormous secrecy surrounding the content of the deal. It isn’t good.